Introducing MyMagic+. A super new way to make the most of your holiday! Walt Disney World Resort has taken your holiday to an all-new level and unlocked a new dimension of Disney magic to make it yours like never before. It’s called MyMagic+. Once you’ve booked your trip, you can use an incredible family of online tools providing recommendations to help you personalise your experience, both at home and on the go. For the first time ever, you can reserve access to some of your must-do experiences—attractions, shows, parades, Disney Character experiences and more—before you even leave home. And then while you’re at Walt Disney World Resort, you can use the amazing new MagicBand or card to connect to the choices you’ve made online. MyMagic+ gives you unprecedented control and makes it easier than ever to enjoy your perfect Disney holiday as you make the most of every moment with family and friends. MagicBands are available to guests staying at selected Walt Disney World Resort Hotels. Please visit MyDisneyExperience.co.uk/privacy for information about our privacy and data collection policies and to learn more about RF technology used in MagicBands and RF cards. Credit card must be presented at Walt Disney World Resort Hotel check-in for purchases made with MagicBand. Purchases are charged to your Walt Disney World Resort Hotel account. Start the fun of your Walt Disney World holiday before you even leave home. Once you’ve booked your holiday, you can use an incredible family of online tools—including an app*—as your digital guide to the magic, both at home and on the go. From maps to videos to itinerary tools and more, everything is in one easy place on your own profile page so you can concentrate on simply enjoying your holiday. Review, make and share plans by connecting to your travel group in Family & Friends. You can even use it to select FastPass+ experiences for an unprecedented array of attractions, shows, viewing areas for fireworks and parades before you arrive. Start the fun of a Walt Disney World® holiday before you even leave home! Visit MyDisneyExperience and discover your personal guide to the magic. You’ll find incredible online and mobile tools that will help you personalise your holiday, reserve access to select Disney FastPass+ experiences, make dining reservations and more. You will be required to create an account and then link your Disney reservation, your Disney reservation number is available from your travel expert a few days after your holiday booking is made. Disney FASTPASS Service has always been a great way to enjoy Disney attractions with little or no wait. But here’s a new way to take FASTPASS fun one step further. Not only can you get to the fun quicker, you can also reserve access to some selected Disney FastPass+ attractions and entertainment experiences before you even leave home. You can make changes on the go—on your mobile device or at in-Park kiosks when you’re on your holiday! You’ll discover more attractions than ever before to pick from. Plus, for the first time, you can even select fireworks and parade viewing areas, shows, Disney Character experiences and more! 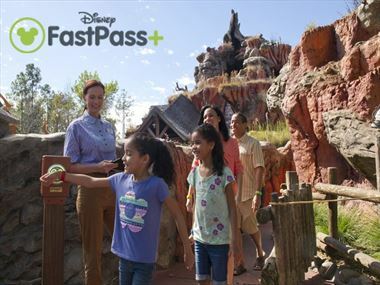 Disney FastPass+ gives you the confidence of knowing some of your must-do fun is locked in, so that when you arrive all you have to do is concentrate on enjoying the moment with family and friends. And best yet, it’s all included with Theme Park admission. Valid Theme Park admission and online registration required. Disney FastPass+ experiences, the number of selections you can make and arrival windows are limited. 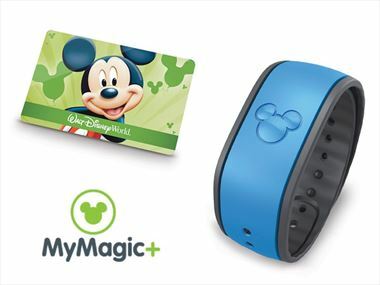 Tap in to the magic with your MagicBand or card and connect to all the Walt Disney World experiences you’ve selected. With just a touch, your MagicBand or card allows you to enter the Disney Parks (with valid Theme Park admission), access FastPass+ selections you made online, and more. These all-in-one devices mean you’ll travel lighter throughout your holiday. Staying at a Disney Resort Hotel? You’ll receive a MagicBand, which also allows you to pay for meals and merchandise, plus enter your Disney Resort Hotel room. Not staying at a Disney Resort Hotel? You’ll be given a card to access the Disney Parks (valid Theme Park admission required) and your FastPass+ selections. MagicBands are available to guests staying at selected Walt Disney World Resort Hotels. Credit card must be presented at Walt Disney World Resort Hotel check-in for purchases made with MagicBand. Purchases are charged to your Walt Disney World Resort Hotel account. Please visit MyDisneyExperience.co.uk/privacy for information about our privacy and data collection policies and to learn more about RF technology used in MagicBands and RF cards. Why stay at a Disney Resort?